This is a Wiccan prayer patterned after the Shepherd Psalm. The latter is found in the Hebrew Scriptures (Old Testament) at Psalms 23:1. The author is unknown. Her hand brings forth the green pastures. She tarries within the still waters. She leads me in fields of fruitfulness for my Glory. I will not be afraid, for You are with me. 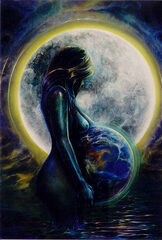 Your womb in the earth will enfold me. You prepare a harvest before me and bless my home with children. You fill me with milk and honey. and I will become part of the earth forever.